Proceed up 6th Avenue, Troy. THE 6th ANNUAL MAY DAY PROCESSION in honor of OUR LADY AND ST. JOSEPH was held Tuesday, May 1, 2007. 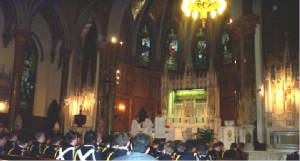 It began at 6 pm with the crowning of the statue of the Blessed Virgin Mary at St. Patrick's Church, Troy. 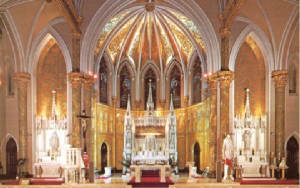 There will then be a procession south on Sixth Avenue to St. Peter's Church, Troy for concluding prayers and Benediction of the Most Blessed Sacrament to be celebrated by Father Bill. If you cannot make the walk, you may join the group at St. Peter's at approximately 6:45 pm. Please remember to bring your Rosary. 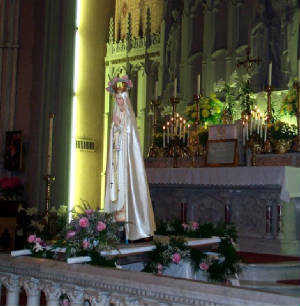 Holy Mother Church has long observed the month of May as devoted to Our Lady. Please join us as we honor Mary in our May Crowning procession.